I recently travelled to the City of Light to attend my very first Paris Fashion Week accompanied by my mother; Dad opted to stay home. 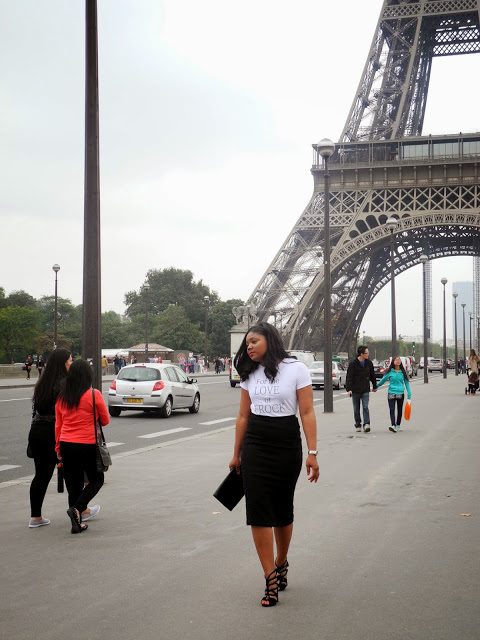 I've never been to Paris before so making the trip to attend PFW was very special. (Well, technically, this was my second trip to Paris as my mother was pregnant with me the last time she visited the country. That counts right?) The weather was crisp, the buildings beautiful, and the city was full of Love. That's definitely my kind of town. The itinerary for the trip was to attend a Fashion show, eat way too many crepes, shop, and of course do some site seeing. First stop, the Eiffel Tower. * Let me know if you want a For the Love of Frock t shirt. I have one in your size!